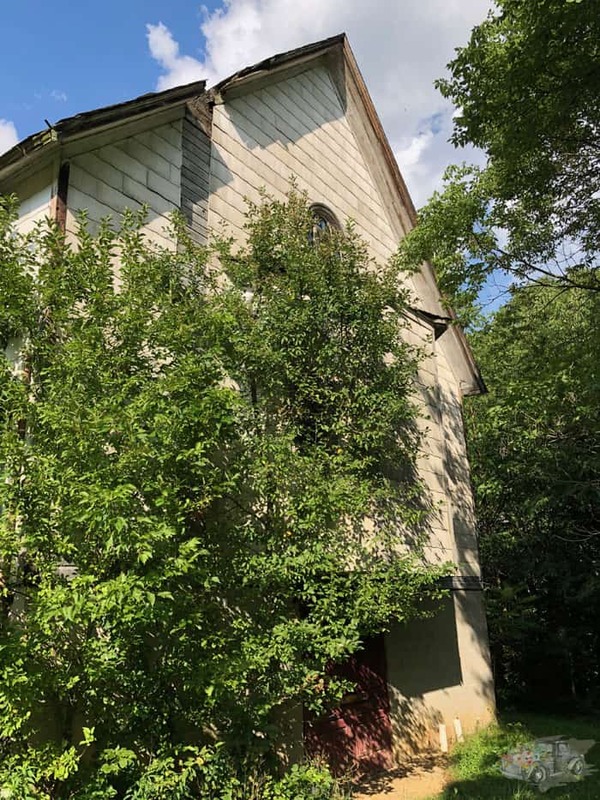 As you are driving along Route 30 eastbound on the way up the mountain you might happen to notice a small, wooden church in the weeds beside an auto body shop. This is the former building of the Trinity Reformed congregation in Jennerstown. This unassuming church has quite the history. Originally located at the crest of the hill, the Trinity Reformed congregation was founded in 1899 and the church building was constructed in 1901. It eventually became a United Church of Christ before it was closed in 1970. The church lingered, unused, for thirty more years before plans were explored to demolish it in 2001. You can see Trinity Reformed Church where the red arrow is pointing. 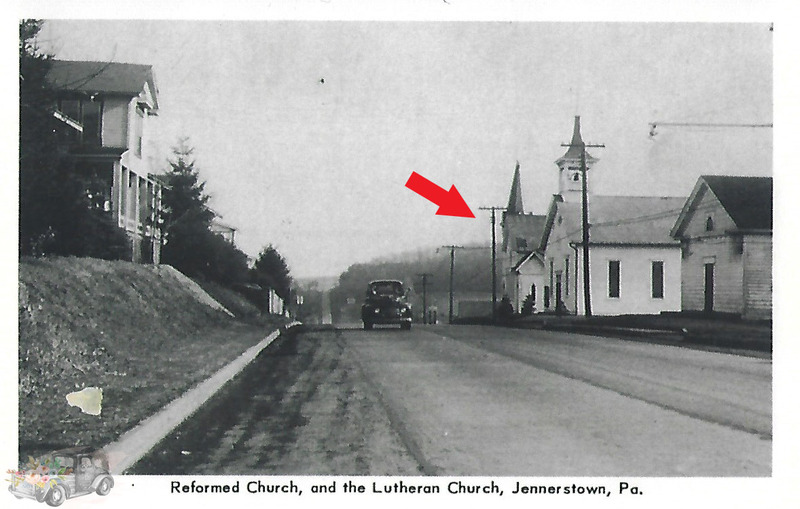 That year — which happened to be Trinity’s centennial year — another Jennerstown church bought the property in order to turn it into a parking lot. 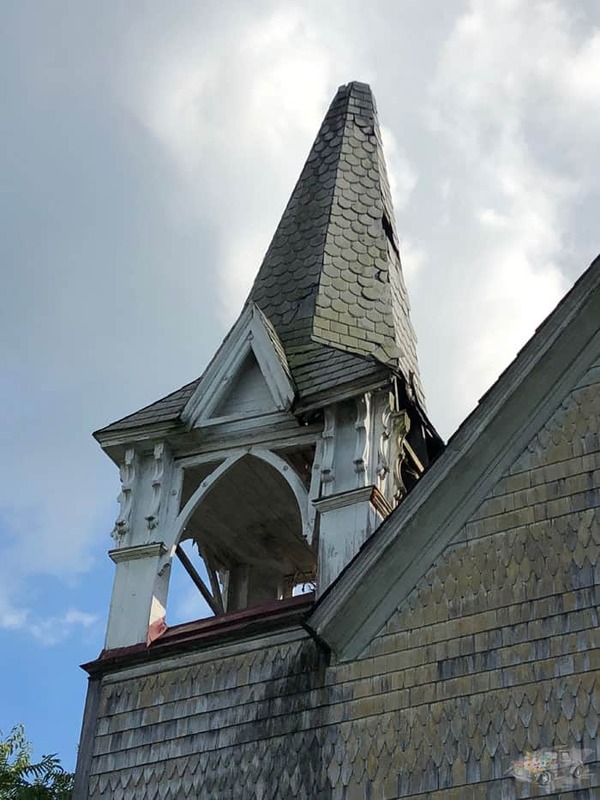 Realizing that the town was about to lose a 100-year-old landmark, area resident Theresa Stoughton Marafino decided to save the church. Now, Stoughton Marafino is no stranger to historic preservation. 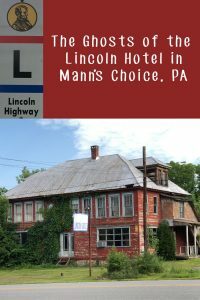 She is the owner of Green Gables Restaurant and Mountain Playhouse along the historic Lincoln Highway. 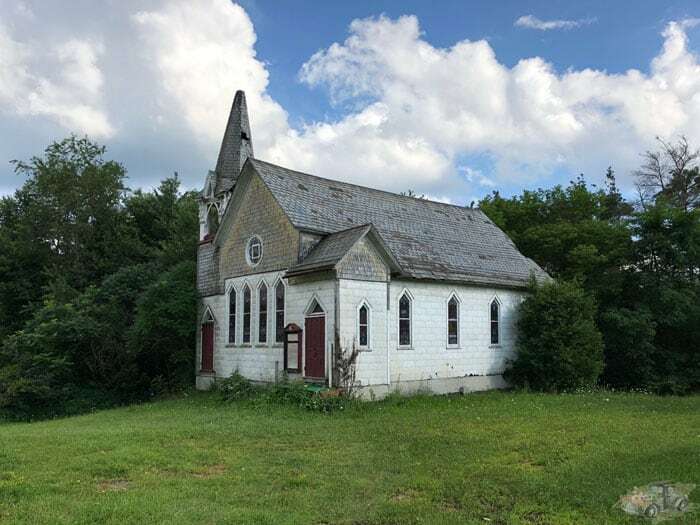 Stoughton Marafino’s family had roots with the church so she set out to save it since the neighboring church was only interested in the land, not the building so she set out to save the church. 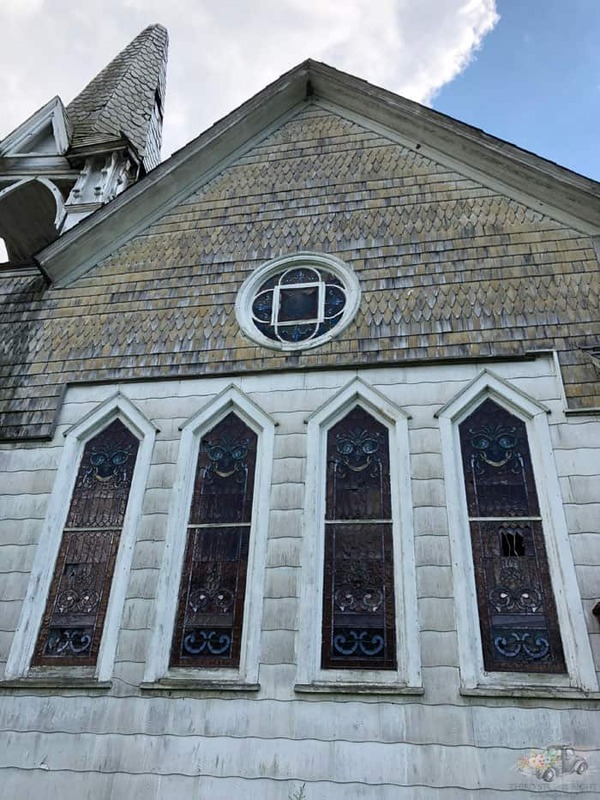 Through her tax-exempt organization, 1901 Church, Inc., she raised the funds to actually move the church from its original location about 400 yards to another site on Route 30 where it stands today. 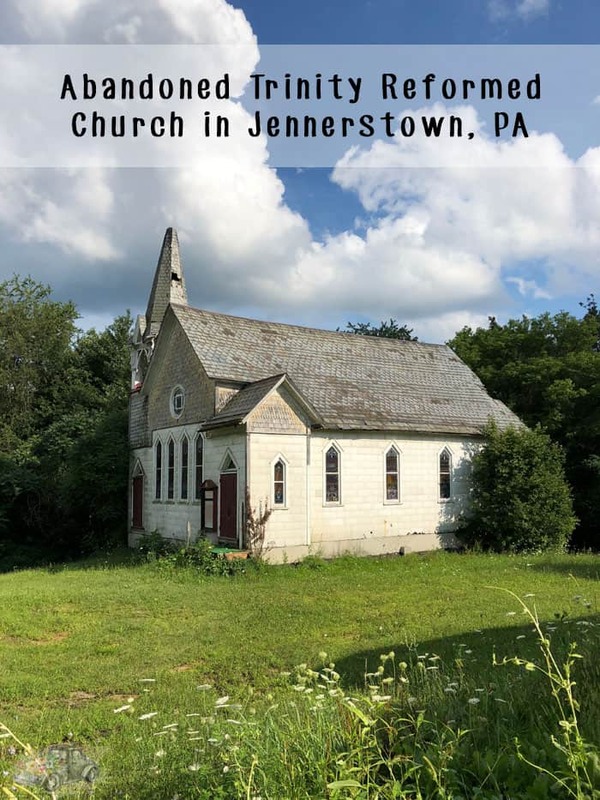 In addition to the Trinity Reformed Church in Jennerstown, the 1901 Church organization has saved three additional churches in Cambria City, Johnstown. 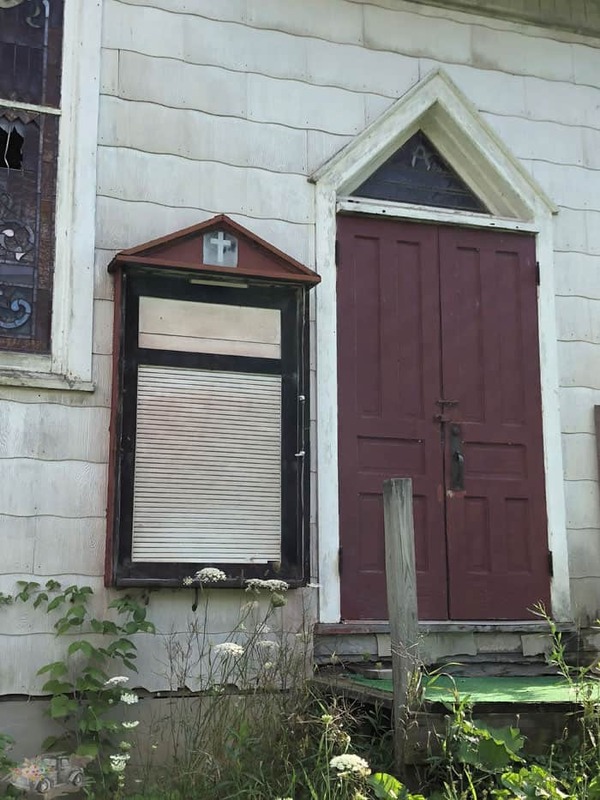 These three ethnic churches were closed by the Diocese of Altoona-Johnstown and were ultimately purchased and preserved. 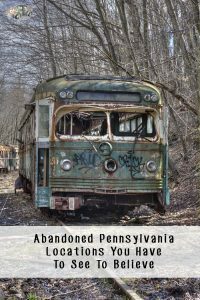 Sadly, not a lot has changed since the church was moved to its new location. A new foundation was built but currently all the the building houses are extra props for the Mountain Playhouse. The steeple seems to be leaning to the right side. The building is beginning to show its age as well. 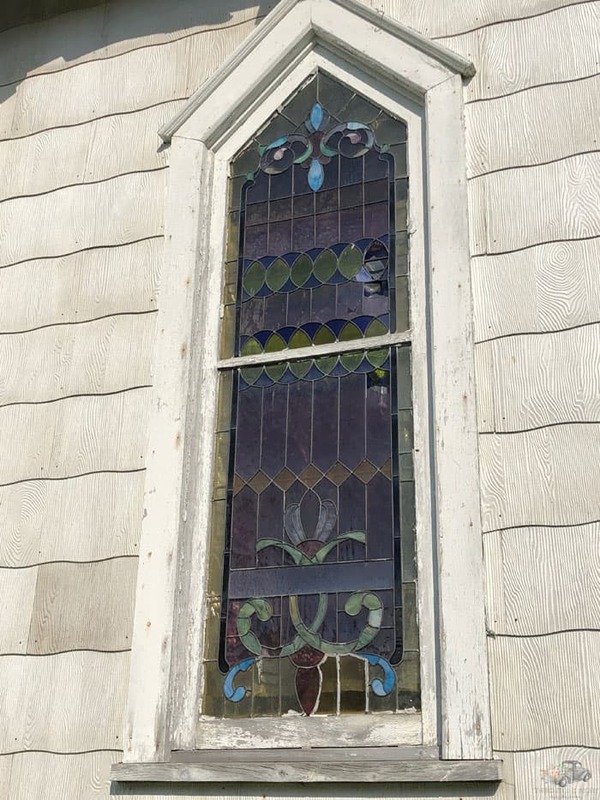 Parts of the stained glass are broken and the steeple sees to have some structural issues. It could also use a new roof. However, it doesn’t appear to be unsalvageable. I love stained glass in old churches so naturally I was drawn to the windows. They are beautifully done with stained glass and for the most part are in tact, minus a few pieces here and there. The ones I was most fascinated by were the triangular pieces of stained glass above the doors. The doors on the right features the words “Trinity Reformed Church” in the glass. At the top of the triangle is the Alpha symbol. 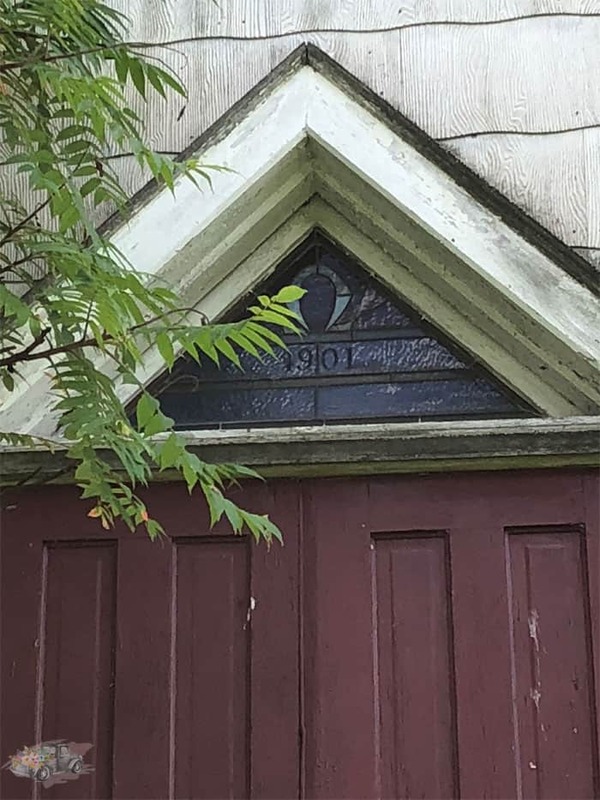 The triangle above the door on the left featured a date of 1901 and the Omega symbol. A year ago if I had visited this site those symbols probably wouldn’t have meant anything to me and I would have overlooked them. Thankfully, Ryan knows a lot about church history so he explained the significance of the symbols to me. Alpha stands for beginning and Omega stands for end. It is a reference to Revelations 22:13 “I am the Alpha and the Omega, the first and the last, the beginning and the end.” Meaning God is the beginning and end of all creation. Alpha and Omega are the first and the last letters of the Greek alphabet. The entrance door with the alpha symbol above the church name. The exit door with the omega symbol above the date. 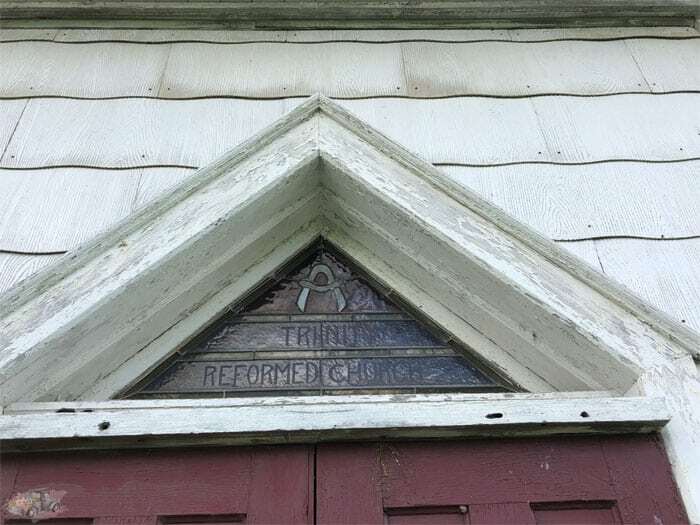 Back when the church was built, parishioners would enter the church through the Alpha door — the beginning. They would exit through the Omega door — the end. As we walked around to the back side of the church there is a vertical area where the top layer of siding is missing, exposing the original siding underneath. This, I assume, was once the location of the original chimney but it had either collapsed or was removed for the move. Right beside where the chimney was is another area that juts out from the rest of the building. Considering the doors were on the opposite side of the building, I assume this was the pulpit or alter area. The simplicity of this church is really beautiful and takes you to a simpler time. 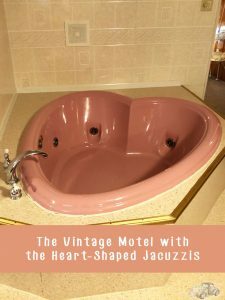 There is so much potential, not to mention history, here that I would love to see the building further restored. In the meantime, I’ll be keeping my eyes out for other Alpha and Omega doors!